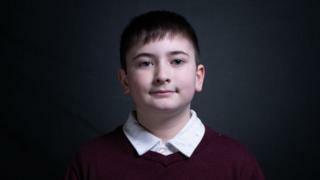 A schoolboy bullied for his surname – Trump – will attend the president’s State of the Union address on Tuesday. Joshua Trump, an 11-year-old boy from Wilmington in Delaware, is not related to US President Donald Trump. But his parents say his classmates call him an “idiot” and “stupid” for sharing the Trump name. Senators and members of Congress also invite guests to the Capitol, with both parties using their choices to make clear political statements. Joshua, however, will be one of 13 people specially invited to the address by the president and the First Lady. His parents, Megan Trump and Bobby Berto, told ABC affiliate WPVI last December that the bullying had started in 2015, when President Trump first announced that he was running for office. After finding out he was being called names, they pulled him out of school and home-educated him for a year until he joined middle school. They hoped that he wouldn’t be bullied in his new school, but he was. “He said he hates himself, and he hates his last name, and he feels sad all the time, and he doesn’t want to live feeling like that anymore,” Ms Trump said at the time. A White House statement says that although Joshua has been bullied for sharing the president’s last name, “he is thankful to the First Lady and the Trump family for their support”. Other people invited by the president and First Lady include a survivor of a synagogue shooting in Pittsburgh, a young woman recovering from long-term substance abuse, and the family of a couple that were killed in a shooting last month – which was allegedly carried out by an illegal immigrant. There’s no denying that there’s a political message behind many of the guests the president has chosen. Mainly, he wants to make clear that he’s tough on terrorism and immigration. But senators and Congress members from both main political parties are grabbing the opportunity to send messages of their own. Many Democrats and Republicans are bringing guests from either side of the border wall dispute – a cornerstone of President Trump’s electoral campaign in 2016, which continues to be extremely contentious. Democrats Jimmy Gomez and Bonnie Watson Coleman have both invited former employees of Trump National Golf Club, who were reportedly undocumented at the time they worked there. “President Trump justified shutting the government down for five weeks by demonising immigrants as the scourge of the country and the root of our nation’s crime and insecurity,” Ms Coleman wrote in a statement. And Democrat Senator Jeff Merkley, from Oregon, is bringing a mother and daughter from Guatemala who were separated for almost two months at the southern border last year. “This child separation policy came from a dark and evil place within the heart of this administration,” Mr Merkley said in a statement, adding that his guests would help the country “bear witness to the suffering that this cruel policy inflicted”. Some Democrats have also invited transgender veterans, in response to a ban against trans people serving in the military that was enacted last month. Among them will be Tavion Dignard, a trans man who served in the US Navy for four years, and Logan Ireland, an air force sergeant who served in Afghanistan. On the other side of the political spectrum, Republicans Marsha Blackburn and Tim Burchett have jointly invited a couple whose son was killed in a car crash – for which an undocumented migrant from Mexico has been charged. Republican congressmen Andy Biggs and Chip Roy are bringing border patrol officials. Mr Biggs has invited border patrol agent Art Del Cueto, while Mr Roy is bringing Brandon Judd, president of the National Border Patrol Council. But this isn’t the first time politicians have used their State of the Union invites to make a statement. Last year, as well as wearing black to show their solidarity with the #MeToo movement, many Democrats invited people from the Daca and Dream programmes for undocumented migrants who were brought to the US as minors.